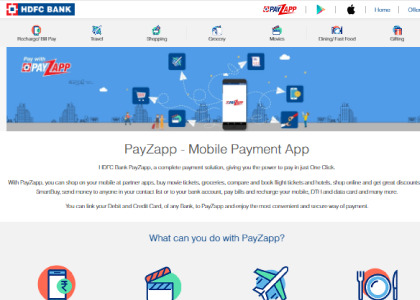 Payzapp is an online payment wallet that has been introduced by HDFC bank to allow its users to make the most of e-wallets. The PayZapp allows you to recharge your mobile, send cash, make your bill payments, order food online, and a lot more with its easy to use yet efficient app. Are you tired of constantly re-charging your wallet with money, if it’s a yes, then you wouldn’t be disappointed with PayZapp. For, this eliminates that process and makes your online shopping experience very pleasant. There are a lot PayZapp coupons that one could use to avail the best discounts while shopping through e-retail merchants online. PayZapp is designed by keeping customer usability in mind and hence using PayZapp for online transactions can be done in less than 3 steps. That’s right, quit worrying about getting a top-up on your e-wallet and switch to PayZapp from HDFC for a better experience. Happy shopping. Get 15% Cashback on Min Rs.200 Purchase on all the Reliance Store i.e., Reliance Trends, Reliance Digital, Reliance Smart, Reliance Smart, Reliance Fresh, Reliance Footprint, & Sahakari Bhandar. Cashback will be auto-credited to your Visa cards or PayZapp Visa card within 30 working days after the date of the transaction made. Get 25% cashback up to INR 250 with PayZapp wallet. Use Code on PayZapp wallet page.Offer is only applicable on Mobile App.Offer is valid once per user during the offer period. Hurry up! This offer is valid only until 25th February 2018. PayZapp offers 5% Cashback on all Entertainment, Groceries and Travel transactions. Transaction to be completed through Pay with PayZapp using HDFC bank debit Card provided customer is registered for PayZapp at the time of the transaction. Offer is valid from 7th July to 31st March 2018 both days inclusive.Maximum Cashback is limited to Rs.250 per customer per month.Offer is valid on all Debit Cards held by the customer except for JetPrivilege Debit Card. Follow the link to know more.